Reviva Labs recently introduced their Stem Cell Booster Serum, which claims to "make skin more responsive to the day or night cream applied over our serum." In addition, they note that Swiss research with volunteers aged 37 to 64, determined a significant decrease in crows feet wrinkle depth for 100% of the participants. I'm no expert when it comes to understanding plant stem cells and how they interact with human skin, but in reading many articles and studies about the possibility that they can improve both skin and hair regeneration and growth, I don't believe that it's an entirely unfounded claim. 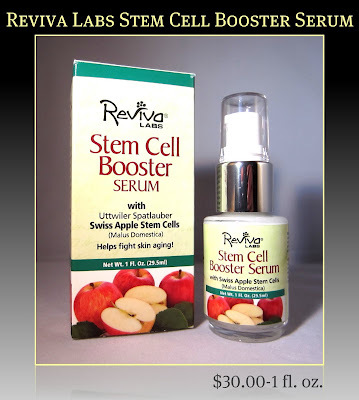 Plant stem cells, particularly the Swiss Apple Stem Cells that are found in Reviva's serum, are becoming a much sought-after ingredient in skin care. Most of the studies and articles show promising results, and the majority of the products that contain these cells are very expensive. Reviva's is by far the most reasonably priced serum I've come across. 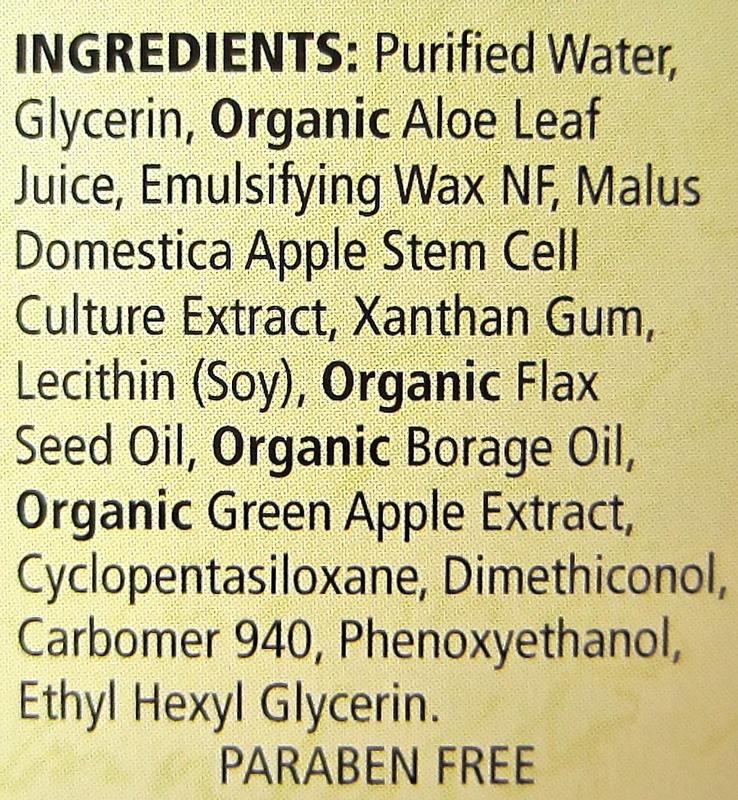 Here's a look at some of the benefits and the ingredients from the packaging label. Testing skin care products to determine how well they work can be time-consuming, but I find one of the best ways to truly know if a product works well for me is to use it for at least 3-4 weeks. I then switch to using another product, and during that time I may notice that my skin just doesn't look as good (glowing, smooth, even) as it did previously. I then switch back to the product I was using, and often times, I can achieve that "good" look again. That's what happened to my skin with this product. While I may not have noticed any dramatic overnight sensation, I was happy with the way my skin looked and felt while using it. Because I look at my face every day, it can be difficult to determine just how well something's working because the changes are so subtle. Sometimes, it's when I stop using a product that I realize just how effective (or ineffective, depending on the product!) it really is. This product was furnished to me for review, but I can tell you that I've been happy enough with the results to purchase two more bottles. 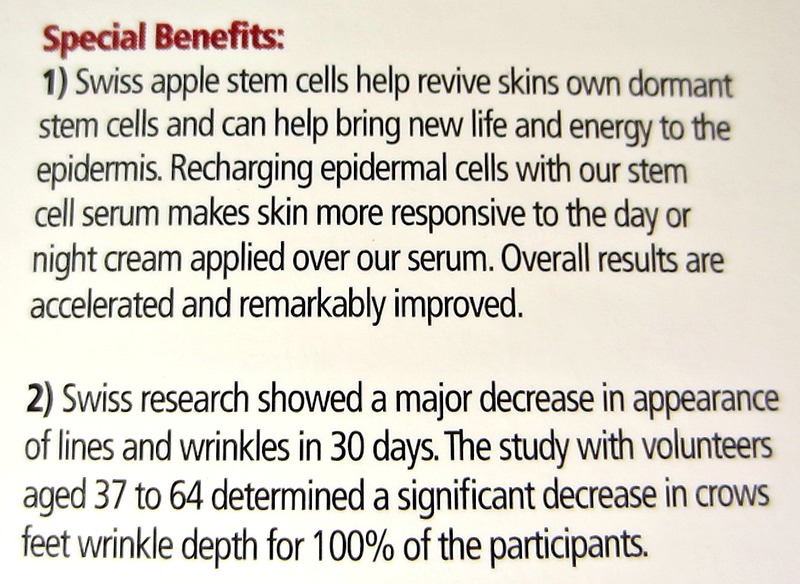 Is it really the elusive Uttwiler Spatlauber Swiss Apple Stem Cells that are doing the trick? I have no idea, but I'm starting to believe that they have something to do with it! I do know that when my skin looks good, it always gives me a boost of confidence, so this product will remain in my skin care arsenal. 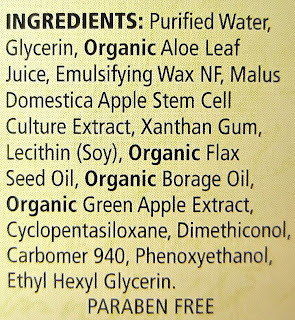 If you've been thinking about trying a skin care product that offers apple stem cells, this is one that you might consider. It's priced at $30.00 for a 1.0 fl. oz bottle, and I only use one pump in the morning and one at night, so a little product does go a long way. I apply this as my first product over cleansed skin, followed by my moisturizer or another serum and then my moisturizer, depending on my skin's needs. One pump gives me enough product to cover my face and onto my throat, which is an area that should be focused on as much as your face with skin care products. Reviva Labs offer their products in select health food stores, as well as on their web site at RevivaLabs.com. *Product featured was furnished by the manufacturer or PR firm. 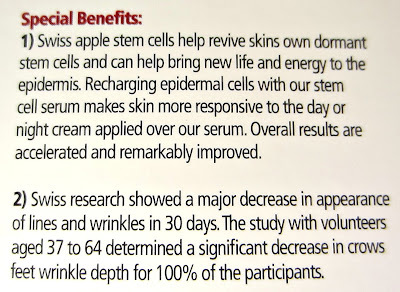 I always wonder about these Apple Stem Cell serums... Good to hear there's a more affordable one available!